Boom nose Five Nylatron sheaves mounted on heavy-duty tapered roller bearings with removable pin-type guards. Quick-reeve type boom nose. Removable single sheave auxiliary boom nose with removable pin type rope guard. Crane Control System (CCS) "Graphic Display" RCL load moment and anti-two block system with audio-visual warning and control lever lockout. This system provides electronic display of boom angle, boom length, load radius, boom tip height, maximum permissible load, actual load and warning of impending two-block condition. The work area definition system allows the operator to pre-select and define safe working areas. 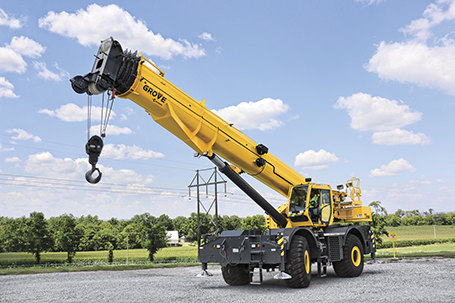 If the crane approaches the pre-set limits, audio-visual warnings aid the operator in avoiding job site obstructions. Counterweight Standard 9979 kg. Hydraulically installed and removed. Controls located on superstructure. *Optional 2268 kg pinned slab increases counterweight to 12 247 kg hydraulically installed and removed with standard counterweight. Cab Operator-controlled 20° hydraulic tilt, full vision, all steel fabricated with acoustical lining and tinted safety glass throughout. Deluxe seat with headrest, incorporates armrest-mounted electronic programmable single-axis or dual axis controllers and a jog dial for easier data input. Tilt/telescoping steering wheel with various controls incorporated into the steering column. Other standard features include hot water heater, cab circulating air fan, sliding side and opening rear window, sliding skylight with electric wiper and sunscreen, electric windshield wash/wipe, fire extinguisher, seat belt, air conditioning and dual cab mounted work lights. Chassis Parallel box section fabricated from high-strength, low-alloy steel with integral outrigger boxes, front and rear lift, tie-down, and towing lugs. Outriggers Four hydraulic telescoping single stage double box beam outriggers with inverted jack cylinders and integral jack holding valves. Three position settings, 0%, 50%, and fully extended (100%). Aluminum fabricated outrigger floats 609,6 mm diameter. Maximum outrigger pad load: 57 290 kg.Controls and crane leveling indicator located in cab. Extension and retraction are through the CCS system. Transmission Rangeshift with six forward and six reverse speeds. (Three speeds high and three speeds low). Front axle disconnect for 4 x 2 drive. Axles Front: Drive / steer with differential and planetary reduction hubs rigid mounted to frame. Rear: Drive / steer with differential and planetary reduction hubs pivot mounted to frame. Automatic full hydraulic lockouts on rear axle permits. 254 mm of oscillation only with boom centered over the front. Brakes Full hydraulic split (dual) circuit dry disc operating on all wheels with dual calipers. Parking brake is spring applied / hydraulically released on the front axle input shaft. Lighting Full lighting including turn indicators, LED head, tail, brake and hazard warning, and two halogen work lights mounted on cab front. Gradeability (theoretical) 70% to drive train stall based on 55 763 kg GVW with 29,5 x 25 tires, standard. counterweight, auxiliary hoist and manual bi-fold extension. *Optional equipment Auxiliary Hoist Package: Includes MTW 19-241 hoist with electronic hoist drum rotation indicator, hoist drum cable follower, third wrap indicator with hoist function cut-out, 214 m of 19 mm of 35 x 7 class rotation resistant wire rope. • Auxiliary Lighting and Convenience Package: Includes superstructure mounted amber flashing light, dual base boom mounted floodlights, in-cab R.C.L. light bar and rubber mat for storage trough. • Outrigger monitoring system with outrigger beam position display on R.C.L. screen.